The sequel to last year’s highly successful, The Hippocratic Crush <On call 36小時>, started filming earlier. The sequel reunites the original cast and continues the love arcs of the doctors, while adding Lawrence Ng (吳啟華), Tracy Chu (朱千雪), and Eliza Sam (岑麗香) to the drama. Kenneth Ma (馬國明), Him Law (羅仲謙), Tavia Yeung (楊怡), and the cast were at the blessing ceremony for The Hippocratic Crush 2 on February 28. Kenneth was teased for his appealing bachelor image, in which female costars have been reported to fall under his mesmerizing spell. The role of “Dr. Cheung Yat Kin” has made Kenneth Ma into a highly desirable Diamond Bachelor on the market. Last year’s Miss Hong Kong, Carat Cheung (張名雅), openly admitted that she idolized Kenneth. Recent Hong Kong tabloids also blazed headlines that Kenneth has now become a double-timing player, by dating Natalie Tong (崔建邦) and Eliza Sam at the same time. Although Kenneth had attended a group barbecue, in which Eliza was also present, he may face stiff competition against Eliza’s numerous male admirers. Not taking the recent news seriously, Kenneth just laughed over speculations of his love life. Kenneth and Natalie’s friendship date back to 2010’s A Fistful of Stances <鐵馬尋橋>, when they grew close on set. Their relationship rumors grew when Kenneth celebrated his 39th birthday with Natalie and their friends. Although Kenneth claimed that he regarded Natalie as only a younger sister, their romantic rumors failed to stop. Lawrence Ng and Tracy Chu portray a romantic couple in The Hippocratic Crush 2. Lawrence praised the newcomer for her performance while Tracy thanked Lawrence for helping her prepare for filming. Tracy also denied reports of a rivalry with Jacqueline Wong (黃心穎) due to Tracy being more promoted after last year’s Miss Hong Kong pageant. Note: This article was updated on February 28, 2013 at 4:55 PM to reflect additional details that emerged in the evening news edition. its not up to kenneth to say that natalie is amigo’s girlfriend,what if she isnt really amigo’s girlfriend? he is using amigo to clarify his own rumour,i think its not fair for both amigo and natalie. i dont think they are a pair now,maybe they used to be a pair but now they are just good friends. everyone knows amigo and natalie are a pair! kenneth is just pointing the obvious thing, what’s wrong with that? what you call obvious is just rumours.as long as they dont confess it to public its still not clear if they are lovers. arghh… was hoping so much that MingYi can develop in real life! tavia looks so pretty in this photo! looking forward to the sequel! Tavia amazingly look great n beautiful especially she wear the blue dress during outdoor filming.She look very demure in most of the outdoor filming picture. I am very hopeful that one day Kenneth and Tavia will be a couple in real life. I’m looking forward at On Call 2. Kenneth still looks better with Sharon! kenneth does look a lot better than before. he looks like he has lost a bit of weight and his skin complexion is a lot more smoother. before it had holes and very oily. 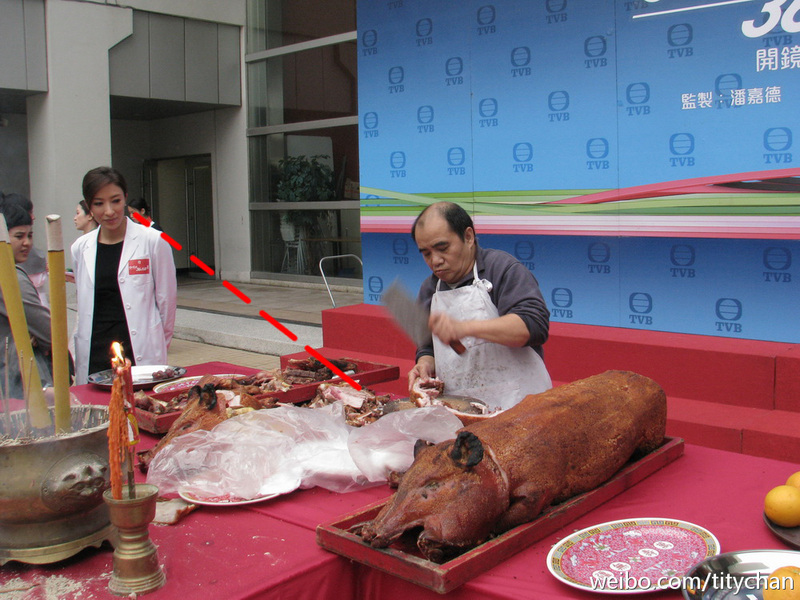 Out of topic , but tis pic quite funny reaction of Tavia keep staring the roast pig when people around her keep chatting.The guy beside her not yummy enough to be stare.